Weaning your baby onto solid food: tell Ella’s Kitchen about introducing veg: voucher to win! Ella’s Kitchen want to know your thoughts about introducing your baby to vegetables at the start of weaning. And you could win a £100 Amazon voucher for telling us! What was the first solid food you tried with your baby – and why? What kind of veg did you introduce your baby to first – and when? And which veg does your baby like best? What challenges have you faced when introducing veg? Have you got any tips for other mums on getting your baby to eat veg? We'll keep this thread open until Tuesday June 7th, and we'll announce the winner's name on Thursday 9th June. This discussion is sponsored by Ella’s Kitchen, the 100% organic baby-food range. Please note that comments and pictures you post here may be used by Ella's Kitchen in future marketing material. Ella’s Kitchen has recently launched its Veg For Victory campaign which is all about educating and inspiring mums, dad and little ones to start weaning with veggies – because, they say, research shows that the sooner your child is introduced to veg, the more veg they will eat. Ella’s wants to create a nation of happy, healthy veg lovers! My first experience introducing baby to vegetables wasn't actually with my own children it was my partners daughter. She lives with her mum and comes to stay with us some weekends an all holidays and she wasn't that little but she already had her favourite foods and it definitely wasn't veggies. She was 1.5 years and for us it was normal to eat vegetables but wasn't very "friendly" towards it. Think most important thing for us was to eat the same for all of us. Lots of vegetables first. Think hunger has the best flavour. And we use to play games like asking her to close her eyes and try to gues what it is what she's eating. Takes more then 1 try to like what she eats (more like 15 times) but she eats nearly all vegetables now. Never tried to go by talking how good it is for you because kids don't like to eat what is good and healthy but she was eating it ever since. I think we all the same don't like something just because we don't know how it taste like. Now she much older and when ever she comes we always cook and prepare food together and she loves this idea that she eats what she made herself. My step into the wonderful world of weaning my first was a little daunting – it was a case of steaming carrot/butternut and mashing it with a fork – it went down ok with my daughter even though I’m sure she was wondering what the heck I was doing (to be honest I think she would have been quite happy sticking to milk) still the same now at nearly 4 years old! It was pretty much a case of sitting her at the table with us and having the same food as us but mashed up right from the word go and I continued to go down that route when my second child started weaning, although this was an entirely different experience where we had a lot of choking and coughing up = a lot more cleaning up involved! I did baby led weaning with both my children and they both ate vegetables without any problems (and still do). They've eaten whatever we're eating from the moment they weaned so have a wide variety of tastes right from the beginning. They didn't have a 1st veg. My daughters first proper solid food was fajita wraps-lots of different veg (at 6 months!) and my sons was carbonara, which contained lots of peas & carrots (at almost 6 months). Both of them had tastes of fruit & veg prior to this-bananas, cucumber sticks, cooked carrot sticks, cooked apple slices, cooked pepper sticks, tomato slices! No need to spend hours making everything smooth!!! My Son's first soild food was steamed carrots pureed with breast milk.because carrots are sweet and breastmilk gave it a familar taste. his 1st vegs were carrots, sweet potato, cauliflower, and broccoli. it he loved them all but i will say he is quite partial to sweet potato and still stuffs down double portion of mash or chips. Just remember easy does it. if your baby has only 3 spoons and turn away thats ok try another day. if you are breast feeding or expressing mixing in some breast milk will help give a reassuring familiar taste. My first experience with weaning and vegatables didn't go very well at all! 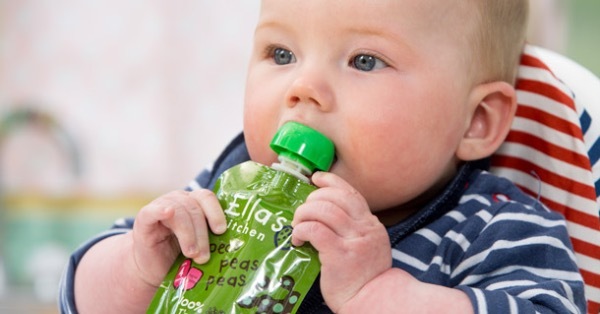 We received a free packet of Ella kitchen "peas, peas, peas" in a baby box full of money off vouchers and other goodies, I read on the packet that it was suitable from 4 months so at 4 months old I tried my son with it, he gagged so much and went bright red! I did also read that it was normal and babies have a very bad gag reflex so I continued to give him a little taste a couple times and he projectile vomited all over himself, me, the chair and the carpet! Mixture of milk and green mushed pees!! So we scrapt that idea and tried sweet potatos, pumpkin, apple and blueberry which sounds like the worst combination in the world! Guess what? He gobbled so much!! He now has porridge breakfast and a dinner pouch later in the evening, he will sit and moan waiting for me to bring him proper food! He absolutely loves Ella's kitchen! We weaned initially with mashed up carrots at six months. Really just because I liked carrots myself. Remained a firm family favourite food. As long as there are carrots in it, it will be consumed. Fruit on the other hand, which was introduced later, was, and still is, another matter. My daughter first tried cooked carrot but it wasn't mashed it was just whole but very soft. She was happy to try it but funnily enough now at age two she isn't a huge fan of carrots but she does eat other veg. The second thing we gave her was broccoli and she still absolutely loves it, she likes biting the top off! Peas are also a firm favourite and always have been. I went for the obvious carrot choice first and started off with bland flavours. She always loved her food but my top tip is to mix it up. She loved sweet potato So I thought why not mix a little bit of sweet with savoury. Every mealtime she would eat her veg with a little hint of plum, pear or apple and polish off the lot! With my first baby i wanted to try baby led weaning as i had heard so many positive things about it, so when she turned about 6 months we got all excited, got her a fancy booster chair and got the camera out as we placed a piece of steamed broccoli in front of her (through research i read that broccoli is one of the best foods to start with as babies usually love it). ill never forget the face she made - she hated it lol, she didn't even bite into it, i think the texture of it put her off! After that i continued trying different vegetables but i mostly pureed them as i found she ate more that way - i was more worried about how much of it she was eating, she enjoyed eating parsnips, peas and wasn't such a big fan of potatoes (still isn't). I also used recipes i was sent by the free baby clubs i had joined which gave some great ideas so i could mix up the veg and create new flavors and make meal times more exciting and fun. In between i even tried some vegetable jars but only for when i was out and about or short on time. Looking back i now realise it was more about getting her use to the foods as she was still drinking her usual amount of milk, going forward i would allow my next baby to get more use to holding, feeling and playing with the vegs before expecting them to eat them. My little girl is now 2 years old, and still hates broccoli but loves sweet corn, cucumbers and carrots so i regularly give her these as snacks throughout the day. Definitely introduce veg as well as fruits. 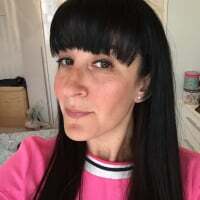 I had a very prem baby and was under a lot of pressure due to her gut having to absorb foods much sooner than a full term baby - she was on milk from 5 days old - which was 13 weeks before she was due to be born. So we literally mashed up our own vegatables with no added salts or sugars and gave her tiny tastes. She sometimes like it sometimes didnt. Did the same with my son and they both now eat anything we give them. They are also happy and willing to try new foods. My eldest hated jars from the start so I started with Pettit fil yogurts/mashed banana/mashed potato and he pretty much ate anything I could mash up lol gradually I increased in lumps. My second loved jars and was a sweet tooth baby- gagged on savoury no matter how much I tried. I actually found that he loved Ella's kitchen pouches as even though they were savoury ingredients- the overall taste was sweeter so they were my key to success for weaning him! After a while he got so used to different flavours that he eats anything you put in front of him! With my youngest I'll try the same route as my last one- Ella's pouches! I have found the main problem as he has got a little older he refuses more and calls most veg yukky . So we found the ellas kitchen pouches a really good way to overcome this as he loves the bright colours . And by making veg more exciting with faces and shapes its more fun to eat I guess this is because the tastebuds and textures change so much for them in the first few months and it can be very challenging as I have panicked a lot trying to think of ways to get him to eat up his veggies. So one of my little tips apart from the fun veggie shapes and faces is to cut up veggies so small they dont see them in fave dishes like spag bol or shepherds pie . I like to cook from scratch anyway and this is a good way to disguise them in food. Also a veggie reward chart call them all different names like Curly Carrot or Peter Potato as they get older and each time your toddler tries or eats it up give him a little treat its really fun . And finally relax the more you stress about your baby / toddler eating all their fruits / veggies it will become more stressful for them and less fun . If you make mealtimes fun they will associate their mealtimes as happy and more likely are willing to try and eat up different things with you . With all 5 of my kids I started at 5- 5.5 months with lunches first, gave them totally smooth blended up potato with blended in brocolli, carrots, peas first before trying any breakfasts at all, most mums think you have to start with a breakfast but I think a easy blended dinner with veg is better to start with its less sweet. I tried to keep the sweeter foods like bananas, sweet potatoes flavoured rice etc etc till as late as possible as I think they are a good reason why kids won't try Veg, they get too used to and love the sweetest tastes so refuse the veg more. People say at the start to introduce veg 1 at a time but again they get too used to just one veg and pick that one out first as their favourite, so with all my kids I used to put 5 very small bits of veg slightly squashed on the plate with nothing else and let them eat it with their fingers first, then adding the main part of the meal with the rest of the veg to spoon feed them. It worked a treat as now all my kids will eat any veg and not just the sweet ones. It's all about discovery, feeling, smelling and normally a bit of playing with them! introducing sweeter foods with veg they 99% will go for the sweetest veg like peas and leave the likes of brocolli. Mashed carrot was her first vedge, it's sweet and funny enough even to me tastes orangy.. We try not to make a fuss when it comes to mixing in vedge. Sweet potato and suede is a lovely mix with a little parmesan. What was the first solid food you tried with your baby – and why? We have started with vegetables as I didn't feel that baby rice is what my little daughter needs to try first. What kind of veg did you introduce your baby to first – and when? And which veg does your baby like best? my little daughter has tried courgette first. I have looked at different weaning plans and found an ideal/safe weaning plan where each vegetable was meant to be trialed for a week in order to gauge a reaction from a baby and see if it causes rash. We saw that she is interested in what we eat and drink at the age of 5 months and introduced solids just after 5 months. My little girl has suffered with constipation after she has tried courgette and since then we had troubles for few months. Things didn't go to plan and my only advice would be to take it easy, see how little one reacts to food and dont' push yourself or little one too hard and it meant to be fun! hopefully he will enjoy these to. It's so important to introduce veggies and make it a positive experience!